It’s here!!! The Gal Meets Glam ‘Garden Party’ rug I designed with Lulu & Georgia is now available to purchase! I gave a few sneak peeks over the past few months showing some details of the rug, but I’m thrilled to finally share the whole thing! To say I’m obsessed is a major understatement and it actually became the entire inspiration for our whole office decor. When Lulu & Georgia came to me at the beginning of last year wanting me to co-design a rug with them, I knew exactly what I wanted to do. As someone who has spent hours and hours searching for the perfect rug, I know how hard it can be to find exactly what you’re looking for. A rug can make or break a room, and I wanted to create something that would be the focal point. Stemmed from my love of pastels and chinoiserie, we created the Gal Meets Glam ‘Garden Party’ Rug. I wanted to create something that felt feminine and luxurious, but was still easy to incorporate into a home. We took the floral and bird elements from a typical chinoiserie print and did an all-over pattern in a beautiful mix of soft pastel shades. Every detail was stressed over to get the colors right and the perfect texture for the final rug. I really wanted a luxurious texture and sheen, and I’m so thrilled with the result! I’m a firm believer in having a rug that not only looks great, but feels great too and this one makes me want to cozy up on it. Thomas couldn’t get over how amazing it felt on his feet (ha!). As I mentioned, our rug has been sitting in our office for the last couple of months and every time I walk in, it brings the biggest smile to my face. It’s been such a rewarding experience seeing an idea come to life and develop into a real product. I couldn’t be more proud with how the final result turned out! While I have the Garden Party Rug styled in our office, my first instinct was to put it in a bedroom. The timing however wasn’t right since most of our furniture is being stored during our home renovation. It all worked out in the end though, as we ended up finding our office space, which has plenty of room to fit the 8’x10′ size. It’s been fun having it in the office because the first thing people ask when they walk in is “Where did you get your rug?!”. The rug comes in three different sizes, 3’x5′, 5’x8′ and 8’x10′, making it the perfect fit for any room- whether that be a bedroom, home office, children’s room, living room or dining room. My home decor style has always been so connected to my personal style, so it was such a natural decision to go with softer, pastel shades. I love walking in my home and seeing a reflection of the colors and patterns that bring me joy and happiness, which is how a home should feel. It’s the space where we spend the most time and I think that’s why so many people feel such a connection to interiors. When I’m in a room that I feel inspired by, I never want to leave! I hope you all love the rug as much as I do! If you are considering buying this rug, I know it can be a big decision so I’m happy to answer any questions you might have, just leave them in the comments section. This rug is absolutely beautiful and the whole decor here, a dream. Such a fun concept for you to create a rug, I love love love it! I love the decoration! This rug is so pretty and I love these pink tones! So beautiful! I absolutely love this desig and set up!! The rug is absolutely beautiful and your office looks incredible lady! I love all of the soft colors. Oh I love this rug and it would look so good with my grey couch and pink chair. Wow that rug is so beautiful! You did a fabulous job! And I love how you styled the rest of the decor to match it perfectly. So lovely! The rug design is beautiful! I would never want to leave that room either, it’s very soothing and dreamy! Can you put up links to all the furnishings? Love all the furniture pieces, the sofa, chairs, ottoman, the garden stool, lamps, end table and coffee tables. Love how it all works together so beautifully with your custom rug! It’s such a pretty rug! You nailed the design. And the office is beautiful! So beautiful! Love ❤️ the colors! Love love love this rug!! Congrats on this partnership! You did an amazing job! Congrats on the achievement! The rug and office space look beautiful! Well done beautiful! I love the print on the rug it’s so feminine but so grown up as well! Wow! It is beautiful – I love the colors and pattern that you picked! Adding to my wishlist. The rug is stunning! This whole room is stunning! Is there any way to link all the other items? Specifically those beautiful trays! Can you share where you go the rest of your furniture in this room? So cute! The rug looks beautiful. This rug is such a beauty! Super pretty and girly! I love that you created something that is your style 100%. Plus it’s very Charleston! Big congratulations!!!!!!!!!!! This is major. I’m very happy for you. Total role model. It’s beaitiful I love everything about that room. You’d be an amazing decorator and Florist. Would love to see posts on how you’d srylw homes and your inspirations. Love that feminine touch. I’d have my office like that 100%. I’d live my clients to come to a place that looks like “me”. It’s important to show part of who you are, honestly and a great way to do that is by your surroundings. You can make it your sanctuary. Where can we buy the rug and the art pieces? Gorgeous rug! We just bought a house last month and I’ve been looking for an area rug. This one would be perfect for our living room! This rug is soo pretty!! Did you get inspiration from your wall art, because they compliment each other so well! I never knew you could customize a rug beautiful job Julia! Would love to know where your dress is from! Gorgeous rug, congrats! Wow. I love everything, Julia! Your beautiful dress and pink mules, and of course the soft color palette of the whole room! Everything comes together and is so lovely. Thank you for sharing. Hi Julia! Where are the blue chairs from that are in the picture? Love the rug, too! Your home is beautiful! Also, I love the scalloped dress you are wearing in these photos. Where can I find to purchase? Thank you! Simply Beautiful! The whole entire space looks so inviting! I love this rug! It’s gorgeous. And I love your office! Can you share where you bought some of the pieces of furniture in your office? I really love the coffee table. Thanks! This room is absolutely stunning! 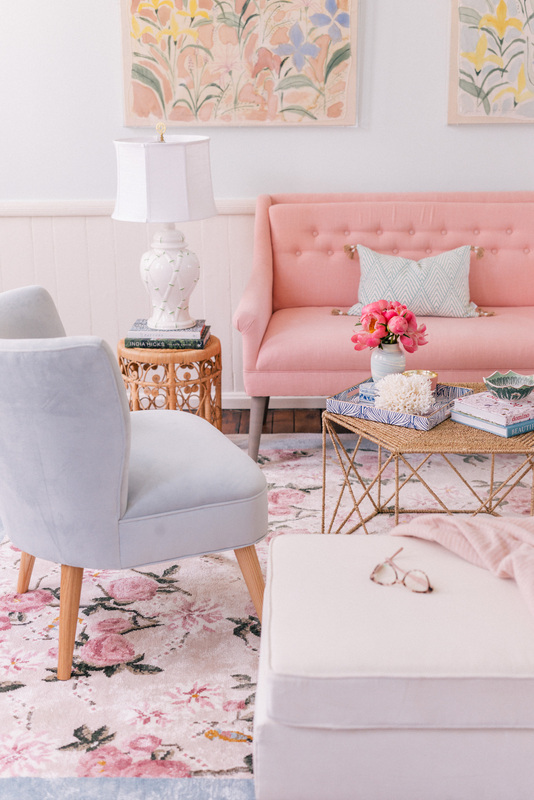 Just everything from that blush couch (I WANT) to your rug. It’s so feminine and cheery. I can only imagine the hard work and decisions you made to come up with the deciding patterns of that rug. I’m afraid if I designed mine it would be a funky mixture of galaxies and aliens with pinks and flowers. Are the wall art pieces vintage as well? So excited for you, Julia! This rug is beautiful! This rug captures your style so well! Gorgeous rug! Congratulations on this collaboration! I absolutely love the design of this rug. It adds so much life and just the right amount of color to a room! The rug is truly lovely and it seems of good quality. Good job Julia. The rug is truly amazing! So beautiful! Can you provide details on your dress? Love the rug also! so so GORGEOUS! That is the prettiest rug I have ever seen! I just have a quick question for you! Could you suggest a paint color that would compliment this gorgeous rug for my bedroom? What a beautiful rug! Great design! Where is the wall art from?? Where are your darling shoes from? I would never want to leave that room either! The rug is beautiful, I love the soft rose shades, very feminine. The room is stunning as well! Sooo pretty! :) <3 I love how feminine yet simple it looks! I love the look. How does you husband like it? While I like florals, my husband not so much, so he would never go for something’s like this. Great decor. The rug fits in seamlessly and complements the color scheme very well. That rug is so pretty I want one! Aw wow it’s so beautiful! I love the rug! Can you please tell me where your slides are from? They are adorable! When I saw your post on instagram this morning I had to head over to the blog to check out this rug even more. Its such a beautiful design. I am so PROUD AND EXCITED for you and this huge collaboration. Congratulations!! I love the look! How does Thomas like it? While I like florals, my husband not so much. Congrats Julia!! It looks SO fantastic!! This is so exciting! I absolutely love the rug, it’s beautiful! Congrats Julia! It is lovely. Great job babe. WOW! Saw this on your Insta Story but didn’t know you designed it. Gorgeous. This is #livingroomgoals FOR SURE.I love every piece of decoration. I would love to see another house tour now that you finished decorating some rooms. ohhh gorgeous, and the wall art…it looks like Lulie Wallace? I love her work – I’m a creative in charleston too! This rug is stunning! I adore the pastels and the gorgeous floral print. I swear if I could I would live in a bed of flowers! Congratulations on this fabulous experience to design your own piece! Oh my gosh, congratulations! It is perfection!!! Congratulations on such a pretty rug! I bet it is so satisfying to partner with a brand and then see a product come to life. Can’t wait to see what other partnerships you guys are working on! That was beaufitful, I’m am dying to see your post renovations!!!! Amazing where is the pink and blue furniture from ? I just love this rug. This is really very beautiful. It would be amazing if you could do a post about all the items in you office. Those blue chairs are stunning with the rug. Okay, I’ve been on the hunt for your shoes for weekssssssss. Where do you find them? Hello! love the rug but also the floral pictures on the wall, where are they from? Is this rug still for sale or is it sold out? Is this rug available to buy now? Where is the pink sofa from? Hello! Wonderful! Who is the author of these pictures?